A Hansgrohe Focus E2 kitchen mixer is the successor of the popular Hansgrohe Focus kitchen mixer. 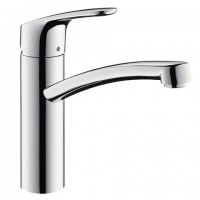 What remains are the dynamic design and the perfect shaped ergonomic handle of the Hansgrohe Focus E2 sink mixer. Also the excellent value of money with proven Hansgrohe technology is of course still available for this kitchen mixer. A new feature is the variety of options that goes along with the huge variety of grip positions, which makes it possible to integrate a Hansgrohe Focus E² kitchen mixer at every sink in every situation. Convince yourself of the variety and elegance of Focus E2 kitchen mixers.